Although originally used for the brutal sport of dog fighting the American Pit Bull Terrier has always been loyal and trustworthy with family members. Unfortunately, illegal dog fighting continues in the United States, but they are also commonly kept to protect people and their property. The ancestors of the American Pit Bull Terrier were bull/terrier crosses brought to America from England and Ireland in the 1800s for use in pit contests. When dog fighting became illegal in 1900 many owners wanted to have the breed recognized and distanced from its history for fighting. 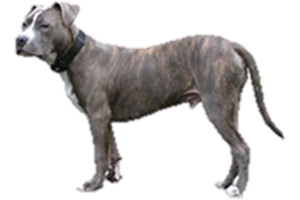 For many years the American Kennel Club (AKC) refused to recognize the breed, which led to the "creation" of the American Staffordshire Terrier, which at the time was no more than a name change (although today there are small differnces between the two). In answer, the faniers began their own registry, the United Kennel Club (UKC), with the American Pit Bull Terrier being their first recognized breed. Is the American Pit Bull Terrier Right for You?